At long last, Alphabet implements a share repurchase program. One of the most important developments for investors within Alphabet's (NASDAQ:GOOG)(NASDAQ:GOOGL) first earnings release under its new holding company structure was the announcement that the company has authorized a share repurchase program for the first time ever. Alphabet's board has authorized a $5 billion repurchase program of its Class C stock that will kick off in the first quarter. Alphabet underperformed the broader market in 2014, losing about 6% of its value while the Nasdaq Composite and S&P 500 posted double-digit gains. That was potentially a wake up call for investors that they might not be able to rely on Alphabet's capital appreciation forever, particularly as the hyper-growth days are in the rear view mirror. As Alphabet's business and fundamentals matured, the calls for the stock to do so have only gained credibility. Cash flow remains healthy, the valuation is reasonable, and shareholders need something else they can fall back on. Implementing some type of capital return program has been exactly what investors have been expecting from new CFO Ruth Porat, and after hinting as much last quarter, she has now delivered. Apple (NASDAQ:AAPL) shareholders have dramatically benefited from the Mac maker's share repurchase activity in recent years. Apple was facing many of the same criticisms at the time: its business was maturing, it was accumulating too much cash, and Apple shares are notoriously volatile for a company of its size. Apple's program is so large that it has been extremely earnings accretive to investors. The exact amount of the authorization is $5,099,019,513.59, which a mathematician will tell you is the square root of 26 times $1 billion. Alphabet is tipping its hat at its new corporate structure. Alphabet will be buying back Class C shares, those that trade under GOOG instead of the Class A shares that trade under GOOGL. In a way, it's a tiny bit more shareholder-friendly that Alphabet is repurchasing Class C shares instead of Class A shares. Here's a quick recap of the company's triple class structure. Source: SEC filings. MRQ = most recent quarter. By repurchasing Class C shares, the repurchase program won't directly affect the distribution of voting power. Theoretically, if Alphabet were to repurchase Class A shares instead, it would only further concentrate voting power within Class B shares that are held by insiders. But then again, this is all kind of a moot point anyway. As of December 2014, Larry Page, Sergey Brin, and Eric Schmidt held 92.5% of all Class B shares, giving the triumvirate an overwhelming 60% of all voting power. Public investors still have little hope in having much say in how the company is run. Alphabet finished the quarter with about $73 billion in cash, of which $42 billion is held abroad. That leaves roughly $31 billion stateside that Alphabet can use for share repurchases. 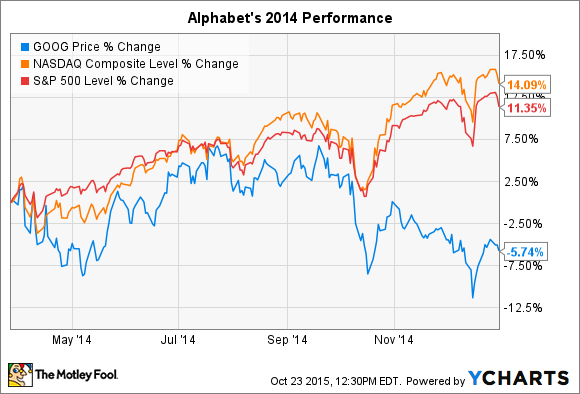 While Apple has been issuing debt to help fund its share repurchases, Alphabet won't need to. Apple's program is so large, and so much of its cash is held abroad, that it has little choice. On the other hand, $5 billion is a modest total compared to Alphabet's domestic reserves, and its domestic cash flow should be more than sufficient to cover the bill (domestic cash has increased by over $10 billion over the past year). Overall, this is very welcome news for shareholders. Better late than never.